Curated by Alyson Baker, Mark Dion and Marichris Ty, State Fair is a group exhibition themed around American rural life, and uses the platform of the state fair as a means to examine topics such as animal husbandry, specialized horticulture, small scale farming, culinary arts, and the pageantry within these fields that occurs at fairgrounds across the country. The show will also incorporate work that references traditional craft, and the myriad of amusements, rides, competitions and entertainment that are presented as part of state fairs. 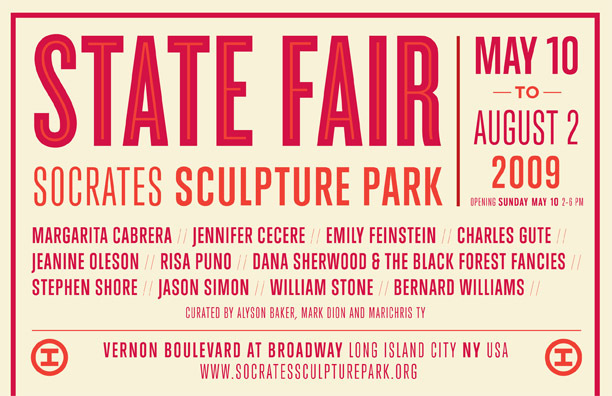 State Fair will feature works by Margarita Cabrera, Jennifer Cecere, Emily Feinstein, Charles Gute, Jeanine Oleson, Risa Puno, Dana Sherwood and the Black Forest Fancies, Stephen Shore, Jason Simon, William Stone, and Bernard Williams, and several projects have been commisioned specifically for this exhibition. The works of both Risa Puno and Dana Sherwood & The Black Forrest Fancies feature interactive performance components that will operate on specific event dates throughout the exhibition, beginning with the opening reception on Sunday, May 10, 2009, 2-6pm. Risa Puno will present a second installment of The Big Apple Showdown Spectacular during the Park’s annual Summer Solstice Celebration, on Sunday, June 21, 5pm-sunset. Also on June 21, artist Jeanine Oleson has invited a group of girls from a local 4-H club to present and talk about their horses, examining the undying connection between girls and horses that inspired her installation at the Park. State Fair is made possible by major contributions from: Bloomberg, Henry M. Buhl, Carnegie Corporation of New York, Charina Endowment Fund, The Cowles Charitable Trust, Dr. Jonathan T. Deland & Emme Deland, Mark di Suvero, Foundation for Contemporary Arts, Inc., Maxine & Stuart Frankel Foundation, Agnes Gund, Hugh & Tiziana Hardy, Emily Fisher Landau, Jo Carole & Ronald Lauder, Ronay & Richard Menschel, Ivana Mestrovic, Margaret T. Morris Foundation, National Endowment for the Arts, Brooke Kamin & Richard Rapaport, Gabrielle H. Reem M.D. & Herbert J. Kayden M.D., Von Rydingsvard & Greengard Foundation, Rev. Alfred R. Shands III, Mr. & Mrs. Thomas W. Smith, Janice Stanton & Ronald Windisch, Silvercup Studios. This exhibition is funded, in part, by the Visual Arts Program of the New York State Council on the Arts and by public funds from the New York City Department of Cultural Affairs. Special thanks to the City of New York, Mayor Michael R. Bloomberg, Queens Borough President Helen M. Marshall, City Council Speaker Christine C. Quinn, Assemblywoman Catherine Nolan, City Councilmember Eric Gioia, and the Department of Parks & Recreation, Commissioner Adrian Benepe. 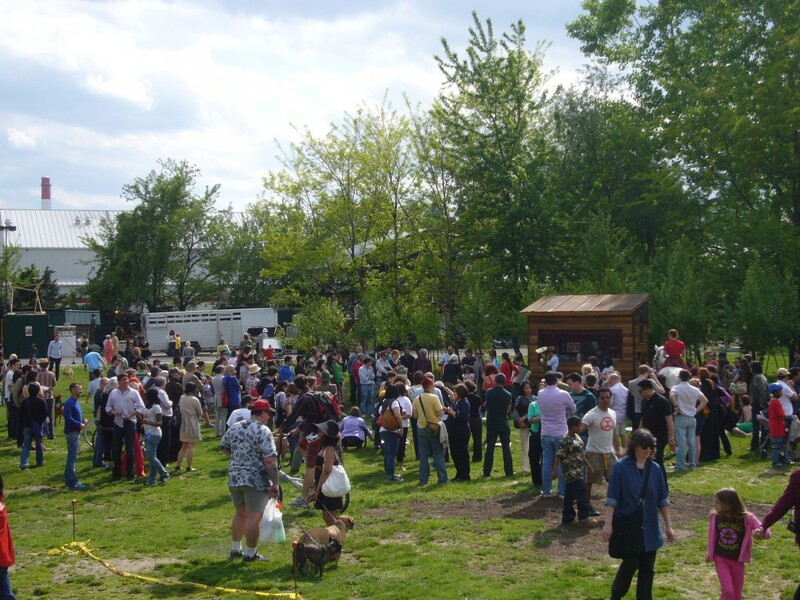 Socrates Sculpture Park is grateful for generous contributions from our many patrons, in-kind support from Harold H. Anthony Inc., Build It Green! NYC, E&T Plastics, Materials for the Arts, Plant Specialists, R & R General Supply Co., Spacetime C.C., Todson, Inc., and the dedication of our volunteers and friends.